This series of classes was given by by Swami Prabhavananda on the path to God through knowledge as taught by Shankara. The basic teaching is that God alone is the all-pervading reality; the individual soul is none other than the universal soul. 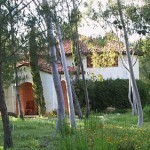 The teachings are what Vedanta is all about, and they're explained in a way that makes sense to a Western audience. The classes represent the swami at his best, and the questions after the class could cover anything. 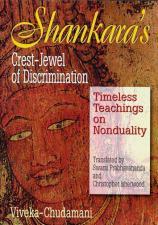 Recommended: The companion book is Shankara's Crest Jewel of Discrimination, translated by Swami Prabhavananda and Christopher Isherwood can be purchased from Vedanta Catalog. You can also purchase a digital CD with all the classes. PCs: right click on the link, and click on "Save Link As" to download the file and listen later. MAC: Hit Option+Click to download the file and listen later. The files below are free to download. Donations are appreciated since it costs us to prepare MP3 files and run our web site. The audio downloads on this page are in mp3 format. They may be downloaded on any platform and listened to using any mp3 player.